2019 Average Interior Painter Cost Calculator - How Much Does it Cost to Hire an Interior Painter? No Wasted Time: Let us do the work for you. We can quickly find reputable painting companies in your area. No Uninformed Decisions: You will receive access to painting company reviews. How Much Does it Cost to Hire an Interior Painter? Expect to pay $.50 to $.70 per square foot for simple jobs and $1.50-$3 for jobs that include difficult trim or repairs. By the hour you should budget $25 per person for simple jobs and up to $50 for more complex jobs. Materials are extra. A gallon of paint can cost up to $75. How Much Do Interior Painters Charge? A coat of paint is a quick and relatively affordable way to refresh your home. Hiring a professional painter means you don’t have to dedicate several weekends to the mundane tasks of prepping, taping, sanding, priming and rolling. It also guarantees a job well done. The price of interior painting depends on your geographic location, the experience of the company, the difficulty of the job, the condition of your walls and the design of your home. Tasks such as painting high ceilings, door painting or painting trim will add to the total price because they make the job more difficult. Further complicating the matter, some companies bid by the hour; others by the square foot; others by the room; and others by the job. The best way to get an accurate idea of price is to seek estimates from multiple panting companies. By the square foot, expect to pay closer to $.50-$.70 for simple jobs. That includes a simple one or two coats of paint without the need for primer or significant wall repairs. If you do need significant wall repairs, a primer and several coats, or fancy trim work, budget closer to $1.50-$3. Geography also plays a role in pricing - you’ll pay on the lower end of the range in rural or less affluent areas. By the hour, labor rates usually start at $25 for basic jobs and cap out at around $50 for complex jobs. That does not include materials. Materials such as paint, rollers, brushes and tarps typically cost extra. 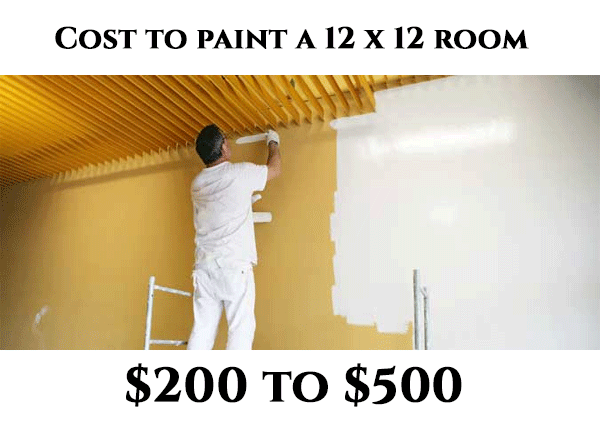 A gallon of paint costs anywhere from $20-$75, depending on quality. Sherwin Williams and Benjamin Moore are the most popular paint brands for residential use. Keep in mind, though, that fewer coats will be required with higher-quality paints, potentially reducing the overall price of the job. Generally, budget anywhere from $200-$500, including all paint and materials, to have a professional paint a 12X12 room. Do some background research on any painting contractor you’re thinking of hiring. Check references and the company’s track record with consumer organizations like the Better Business Bureau and Angie’s List. Check to see if they are a member of PDCA (Painting Contractors Association). If something doesn’t seem right, move on to the next company. Be wary of any estimates that seem too good to be true. The company may not be very experienced or they may use low-quality paint. If you’re concerned about the quality of paint, buy it yourself.